Our dear friend Maria, who is totally into fashion, was complaining how difficult and time-consuming it's to find clothes she liked while browsing fashion magazines and Instagram of her favorite superstars. So, we came up with the idea of using Machine Learning algorithms to help her. You can find a short presentation, explaining the concept, in Prezi. We decided to utilize existent technologies and minimize coding effort as much as possible. So, we chose Salesforce Einstein and Community platforms. First provides with AI algorithms that we trained to recognize images. And second is used for building the UI for shoppers. We also didn't forget about shop's needs. Salesforce platform is a CRM system that provides with detailed analytics about sales and customers. There were two major challenges for us. First, to define the right training model for our AI. And second, to find good images in enough number (we needed at least 1000 images for each brand\ age group\ cloth item\ color and so on) dataset to train the algorithm. As dataset we used is quite small, our app might not work perfectly, and we plan to continue training our ML algorithm using more pictures. It's amazing how, by choosing the right technologies, we were able to built an AI solution only in two days, that just recently was required months of development. 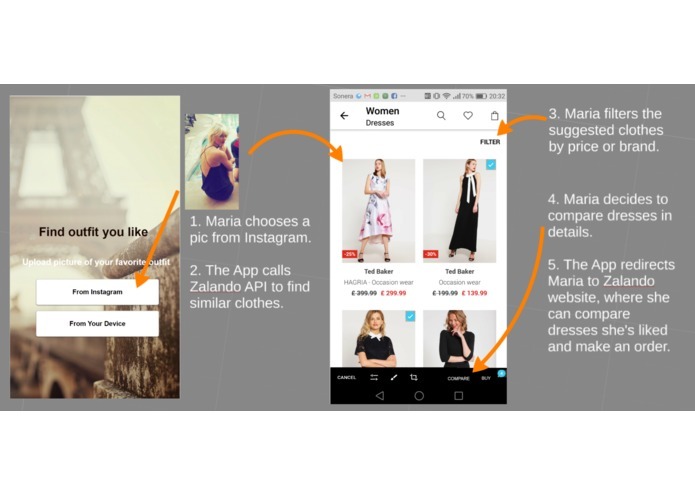 We plan to work on neat UI, so Maria could completely enjoy her experience with OutfitMe App. Also, we need spend couple more days to train our AI algorithm on a bigger dataset. And then, we plan to provide API for our app, so online shops can embed it into their websites.